Have you ever read a book that you can’t stop thinking about? One that pulls you along with every word, that you tell people about, that you Google factoids on, and that leaves you both satisfied and sad when you finish it? 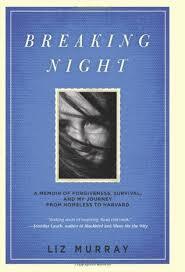 Yesterday I finished just such a book: Breaking Night: A Memoir of Forgiveness, Survival, and My Journey From Homeless to Harvard, by Liz Murray. I’ve been so gobsmacked by it that I had to write about it here. I should say right off that I’m actually a bit surprised by how much I enjoyed it — probably because it’s not the kind of book I typically like to read. First, it’s non-fiction. Second, it’s autobiographical. I’m generally a crime/mystery/whodunit Ian Rankin/Tana French/Minette Walters kinda girl. The grittier and more grizzly, the better. But it was a grey, snowy, sun-deprived day in January (one of many, doncha know) and I was trolling the Internet looking for something inspirational. Something that would move me — and get me moving (to write, mostly — something I have trouble doing on sunny days in May). Somehow, I tripped across this book, on Amazon, or Chapters or someplace like that, and the title combined with the sweet-faced photo on the cover grabbed me. Without giving away too much — because I’m hoping you’ll read it — I’m still now asking myself: How did she do it? How? How did she manage to pull herself out of a childhood of drugs and poverty and homelessness to not merely put herself through high school but in fact graduate from one of the world’s most prestigious universities? And in case you’re wondering, this is a story without hype. There’s no syrup. No sentimentality. For me, the no-nonsense “realness” makes it all the more compelling, and makes Liz herself more likeable and relatable. Fact is, she wasn’t all that much different as a child or teenager than, say, I was. Her descriptions of life at home with her parents reminded me in many ways of my own, sans the nightly drug runs, kitchen mainlining and perpetual hunger. And I don’t mean that flippantly: To my mind, Liz was a normal, average girl — but born into circumstances that many people would not have survived. But survive she did. She found ways to change things, to make her life better. 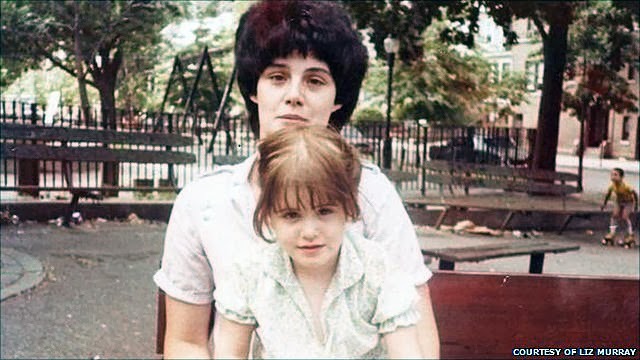 When she didn’t have enough to eat at home because her drug-addicted parents were blowing their welfare cheques on coke, she learned, at 9 years old, how to earn money pumping gas and packing groceries. When she realized, after years of truancy and failing grades, that education was going to be her ticket to a better life, she applied to and became a straight-A student at an alternative high school in Manhattan (she grew up in the Bronx). At her summer job doing door-to-door fundraising for an environmental group, she — despite her insecurity and lack of experience — became one of the top producers, managing to save enough money to devote herself full-time to her studies during the school year. She was beyond resourceful. And beyond strong. I find it extraordinary, in fact, that throughout this experiential rollercoaster (that she seemed barely able to hold onto at times), she didn’t lose herself. Despite warped parenting and transience and tragic loss, she managed to maintain a mental equilibrium that somehow kept her on course and allowed her to see beyond the next hurdle. So many aspects of her life struck me, but one small vignette in particular stands out, maybe because it so perfectly epitomizes her struggles. She asks at one point: “Who would have guessed school books could be so heavy?” Eager to catch up in her new alternative high school, she takes on an unbelievably full course load, putting in 10-hour school days (before homework). However, because she has nowhere to live, she has to carry all her belongings — books included — with her. “My back hurt every day,” she says simply (making no further mention of it). While I wouldn’t want to benefit spiritually from someone else’s physical discomfort, I have to say honestly that just thinking about that book anecdote, I am moved to try to be a better person — and a more productive writer. We all procrastinate, but let me tell you, as a writer, procrastination seems hard-wired into me. Aside from the fact that there are always things that get in the way of writing — work, kids, laundry, life — it’s all too easy to find things to do other than write, even when everything else is done. Reading about Liz Murray — someone so young and so genuinely “disadvantaged” who was able to focus so intently on turning her life around when there were so many obstacles that could (but didn’t) prevent her from doing so… Well, that’s enough of a kick in the pants for me. Good on you, Liz. In a word: wow. It goes without saying that I can’t recommend this book highly enough. If you do read it — or have already — I’d be curious to know what you thought of it. And a final note: if you haven’t yet guessed what “Breaking Night” refers to… one more reason to read the book!